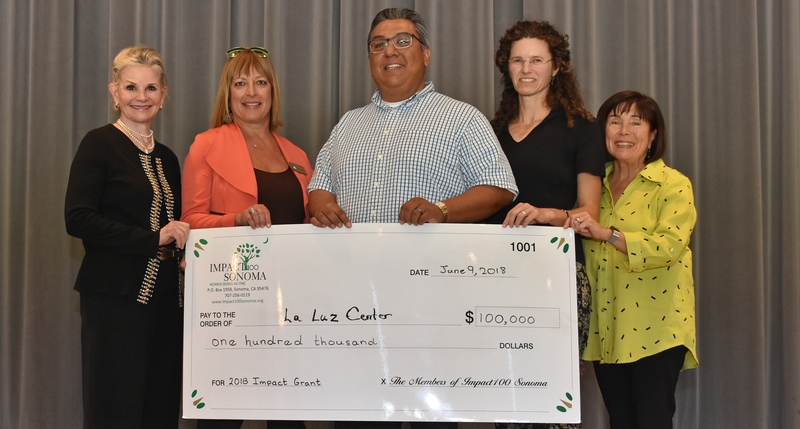 La Luz Center receives the Impact100 Sonoma 2018 $100,000 Impact Grant award to fund its Computer Literacy and Employment Services program. From left to right: Claudia Sims, Grants Oversight Chair, Marcelo Defreitas, Board Chair of La Luz, Juan Hernandez, La Luz Executive Director, Mary Jane Stolte, Impact Grant Chair. As finalists for the $100,000 Impact Grant, Sonoma Valley Mentoring Alliance and Sustainable Sonoma each received unrestricted grants of $10,000. Co-President Lynne Lancaster opened the lively and well-attended event at Hanna Boys Center by welcoming members and their guests. She announced that in 2018 a record number of 305 women joined Impact100 Sonoma providing $305,000, plus an additional $1,000 given by a member in the aftermath of the 2017 fires, for a total of $306,000 in grant money that they would be awarding to nonprofits serving Sonoma Valley. Next year, in celebration of the tenth anniversary of Impact100 Sonoma, a special one-time unrestricted 10th Anniversary Grant of $50,000 will be awarded, in addition to the annual $100,000 Impact Grant and Community Grants of up to $20,000. • Becoming Independent - $20,000 to increase their per-client dollar amount to $150/day and to help fund/expand client-selected activities such as field trips, classes, supplies and activities. • Cancer Support of Sonoma - $20,000 for the Patient Assistance Fund to help clients dealing with cancer to receive low-fee beneficial complementary therapies that are rarely covered by insurance. • Jack London Park Partners - $15,970 to expand the successful pilot program that offers an in-depth investigation of ecosystem dynamics and bio-diversity to all Sonoma Valley 7th graders in fall 2018. • Kenwood Education Foundation - $20,000 to fund KID’s (Kenwood Investing in Dynamic Students) student enrichment programs for the 2018-19 school year after the fires prematurely ended the annual KIDS fundraising campaign and all existing funds were, instead, given to fire victims in the community. • Redwood Empire Food Bank - $20,000 to provide more than 133,300 pounds of fresh produce to food insecure neighbors in Sonoma Valley. • Sebastiani Theatre Foundation - $20,000 to fund 83 scholarships for Latino youth of low-income families to attend Sebastiani’s after-school and summer performing arts camps. • Sonoma Community Center - $20,000 to upgrade aged and outdated safety features, and increase accessibility, in the historic 102-year-old building. • Sonoma Overnight Support - $20,000 to expand its free Day Services program to meet increased demand, and prevent it from having to cut back its hours. • Sonoma Valley Education Foundation - $20,000 to support the expansion, from 50+ to 100 Kindergarten – 12th grade students, of ViVO, an after-school and summer professional music instruction and orchestra program that serves many at-risk socio-economically disadvantaged youth. • Vintage House - $20,000 to fund an external study of the Sonoma Valley senior population to determine their current and future needs in order to inform Vintage House’s future programs and services. Over the past five months Claudia Sims (Grants Oversight), Mary Jane Stolte (Impact Grant), Margaret Grandy (Community Grants), and Lynne Lancaster (Grants Review Committees/Co-President) led the process of narrowing 23 original applications down to three finalists for the $100,000 Impact Grant and 14 finalists for Community Grants. 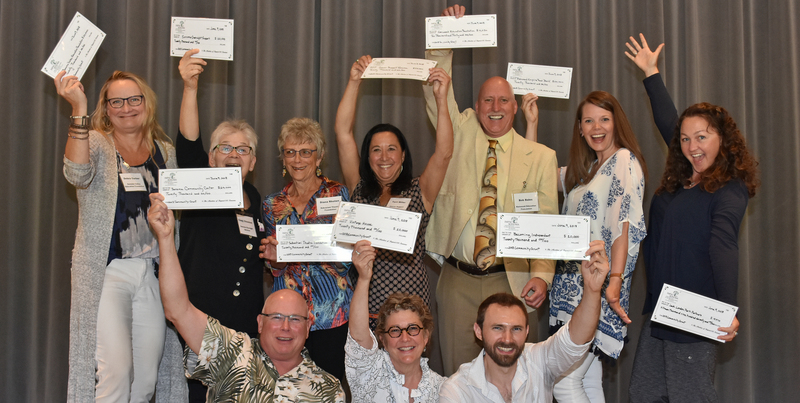 The finalists were selected after careful review by more than 80 Impact100 Sonoma members who served on financial and grant review committees. The grant recipients were selected by a vote of the entire Impact100 Sonoma membership. The Annual Awards Celebration was sponsored by Union Bank with other financial and in-kind contributions from Hanna Boys Center. Impact100 Sonoma is a collective grant-making organization that brings together at least 100 women in a common purpose: to award an Impact Grant of $100,000 every year to a nonprofit organization serving Sonoma Valley. The organization’s mission is to empower women of Sonoma Valley to invest in a more sustainable nonprofit community through collective giving and responsible stewardship. Impact100 Sonoma welcomes all women to join the organization. Information about Impact100 Sonoma can be found at www.impact100sonoma.org or by calling 707-939-5007.